Nowadays, the word that attracts the attention of the internet business community and changes its business implementation to the greatest degree is blockchain. Enthusiasm for blockchain’s application is widespread. The blockchain revolution is touching every sphere and making profound adjustments, promising to change our world in the near future. Blockchain represents great potential for a wide range of institutions. Many successful organizations, like IBM, Microsoft, Walmart, JPMorgan Chase, Foxconn, Visa, the shipping giant Maersk, and even the Nasdaq are using blockchain technology. Their experience shows that the benefits of blockchain are endless, and global changes are still ahead. Blockchain is famous for its modification of traditional interaction and collaboration while providing security and better authentication of files. Imagine two clients working in the same sphere. The first has the exact idea of the project he or she would like to achieve. He/she applies knowledge for the purpose of understanding how blockchain will help to implement it. The second applies knowledge to an existing problem, and has no idea how blockchain should be used to help him or her to achieve the desired purpose. The two situations are very different, and so are the methods of cooperation and blockchain application. It is clear that in both situations, blockchain will reduce the traditional 10 post-transaction actions, and will therefore help save a lot of time, money, and, of course, nerve. It’s difficult to say that the sphere is the key factor in project success. In any case, blockchain represents a meaningful advantage for any organization. Stage 3 – testing of the project demo version, which includes a restricted run to involve a larger number of customers and their data. This is better to do in testnet or on an emulation of the chain — for example, Microsoft Azure proposes a full range of tools like Virtual testnet, Strato, testRPC, and Truffle to compile such tests. Stage 4 – a full running project version. In practice, none of the projects based on public blockchains have come to Stage 4, but a bunch of organizations have implemented on full-scale private/consortium chains. Then you have to build the architectural plan of the project. For this, develop a budget, a deadline, and the possibility of engagement for any internal methods of operation and/or outside help. It’s better to have your own experience in blockchain implementation, as it is a new and constantly changing thing. What Is Blockchain and the Distributed Ledger? Blockchain is a global, cryptographically secure sequence of blocks containing transactions, which is used for the validation of said transactions. It creates an immutable and shared record of transactions among the involved parties under untrusted conditions. Also, blockchain provides a lower rate of error and risk, and is able to withstand cyber attacks. The distributed ledger is very similar to Blockchain, and the two definitions are commonly used synonymously. But they have different logic for data validation. While blockchain treats a block as valid if it does not contain transactions that are in conflict through entire chains of blocks, the distributed ledger treats transactions as valid if they are available on the current version of the ledger, which is updated by nodes under the rules of consensus. For simplification, we will use blockchain for both meanings. Observe more information about blockchain right now. These types of benefits from blockchain usage allow one to carry out transactions 24/7 without the involvement of a third party. It largely decreases fees, as well. Thanks to the unique disintermediation model, users can trace their transactions and data without the complexity of adding new operations. Blockchain technology use cases are the most attractive topic for discussion among its users. Blockchain, as the representation of a new era of offerings, receives recognition everywhere: in financial services, legal industries, insurance, utilities, the public sector, advertising, healthcare, auditing, the supply chain, manufacturing, and real estate. Let’s deepen our knowledge of these key areas to discover the power of blockchain’s total impact. This will help you to define its value and the best application for your own business. The banking area experiences some of the greatest blockchain influence. Blockchain as a disrupted technology is the newest trend for carrying out financial processes. Take a look at the list of financial services now using blockchain. On the other hand, this displaces traditional banking, as it provides greater accuracy and information-sharing for the financial ecosystem. Companies like Apple and Google are developing payment software. Telecom companies encourage their users to implement their financial transactions through mobile-phone bank accounts. Cryptocurrencies provide a bigger set of advantages, which is decreasing banks’ popularity. Well, that doesn’t sound that bad. Banks continue to exist and offer services that Bitcoin and Ethereum systems do not. The conclusion follows: cooperation is the best solution for the purpose of getting the biggest fruits. The digital currency for financial institution project creation. Financial institutions like Deutsche Bank, UBS, Santander, and the Bank of New York Mellon have approved the use of blockchain to complete financial operations more securely, transparently, and quickly. Ripple is helping banks handle international payments. Thanks to blockchain technology, it has created a real-time gross settlement environment for quick payment implementation. The R3 CEV. The main idea of this consortium is to unite more than 80 banks, technology partners, and regulators to form a special platform for distributed-ledger technology. This is a “new operating system” for financial markets. Forecasting is another area for which blockchain technology offers many opportunities. It provides a useful market-based solution for forecasting. Consider what a prediction market with blockchain applications would look like. For example, Augur is a well-known forecasting platform that works on a decentralized network. It gives rewards for true predictions of worldwide events for its users. Another example of the blockchain prediction market is Stox. Its customers can sell the results of events. Gnosis is an aggregator of certain information from both human and AI resources. Among the set of benefits blockchain gives to the insurance area, data transparency should be highlighted. There is the option to write policy conditions with a smart contract that is created for verifying compliance with a contract or control commitments. You can avoid fraud accidents with a shared database and storage records. The application of blockchain to the insurance industry ensures fair payments in time. Consider proof like LenderBot, a blockchain-based solution with which users can send their claims via Facebook Messenger. LenderBot simplifies validation claims more easily and shortens request time. With blockchain, the healthcare arena can save millions of records and implement complex transactions. 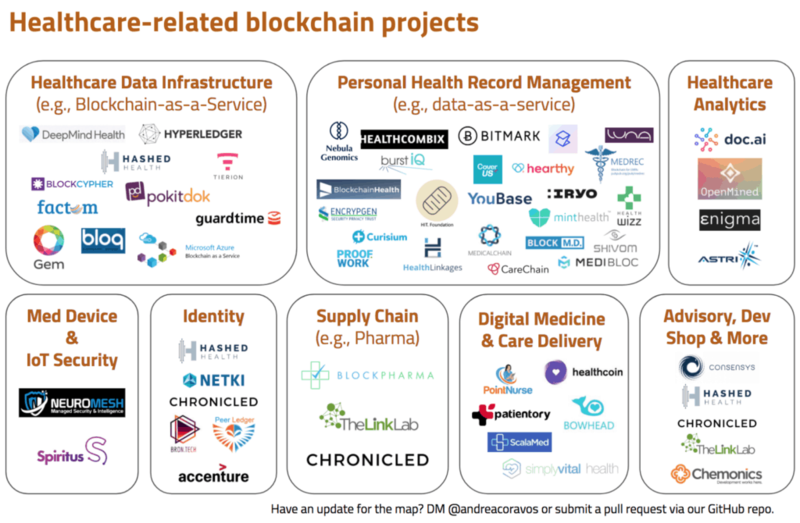 Look through the offerings of blockchain in the healthcare arena. MedRec is a decentralized CMS which provides solutions for medical-data recording and storage. It includes smart contracts for community audits and data transfer. Tierion has developed some unique methods to collect, track, and keep medical records and make payments secure and transparent. Decentralization is a promising alternative for storing data instead of traditional methods, which are more vulnerable to cyber attacks. This provides an extra level of protection for privacy requirements. ShoCard is an example of a digital identity card for verification systems. It offers a set of mobile services that include uploading travel documents, ID authentication, etc. Its experience predisposes banks to cooperate with it. UniquID presents features for identification like peer-to-peer authentication, smart-contract application, and local storage of documents of any type to avoid failure scenarios. Blockchain also provides a fresh approach to the idea of internet trust. While man-in-the-middle attacks and secured, passwordless access could be achieved only with SSL/TLS digital certificates and PGP keys, a lot of users are not using them because of their complexity. PGP allows the creation of peer-to-peer secured access, but a lack of standards and a requirement for advanced skills in computer usage make it uninteresting for the wider public. SSL/TLS certificates require centralized certificate authorities, which are not removed even with the self-signed X.509 standard. Their services are expensive, and are affordable only for huge corporations. Blockchains like Emercoin and REMME allow simplification of the process of TLS/SSL certs issues, only with one transaction and at the cost of one cert, with a small transaction fee. This is without certification authority, which is replaced by blockchain. Blockchain technology offers a set of solutions users can benefit from in IoT security systems. Integration of devices and their interaction in the IoT network are requirements that consume a lot of time and money. This might be improved with blockchain-model use, which provides validity checks, authentication, data verification, and encryption at all levels as the foundation for an IoT ecosystem. This will help you to save time, money, and resources. With specialized software and hardware, Filament provides secure transactions and connections, the possibility of decentralized communication, and device-independent operation. This project is also useful in avoiding attacks, as it prevents dissemination of closed information. Australian engineers have created a blockchain-secured smart home. A high-powered block miner controls the internal blockchain and tracks bad behavior on any IoT network device. If it finds any, it immediately blocks it. And U.S.-based LO3 Energy has established Brooklin Microgrid, a combination of energy-market disruption and smart-meter applications as an element of the smart-home for electricity sales on blockchain without a utility company behind it. The IoT market is also disrupting with a graph-based decentralized system, similar to blockchain but not identical: IOTA. This is a cutting-edge solution for instant communication between IoT and people with IOTA transactions between them. Academic credentials are undoubtedly in need of change. Blockchain can provide them by replacing long-term paperwork and case-by-case checking. Here is a graphic that shows a blockchain-based educational system. For example, Blockcerts — an open platform for academic credentials — was created as a result of cooperation between the MIT Media Lab and Learning Machine. It registers and verifies certificates. This provides the ability to exchange data and store it cryptographically, signed and secure. Thank to blockchain principles, corruption can be eliminated. Blockchain changes the method of voting and paying taxes, and can implement a variety of needed services. Also, a decentralized system is used instead of a centralized one, which improves asset storage and business transactions. The Bitfury Group is a well-known platform for assets transfer within the network. Aragon offers a wide range of of governance tools: for example, handling payroll, accounting, fundraising, and other functions. To sum up, these use cases show us that blockchain applications deserve your attention on the path to success in your business.